HSTS簡介:HSTS全名是HTTP Strict Transport Security 中文名「強制安全傳輸技術」，原理是在第一次訪問https網站時，網站的回覆表頭帶有「Strict-Transport-Security」，該表頭會讓瀏覽器記得，該網站(正確說法是域名)有提供HTTPS安全連線，並於下次連線中強制使用HTTPS，注意是強制喔，不論是點進不帶有https的連結(例如:這個)，或是你故意在網址列打入網址時使用http://為開頭，瀏覽器都會先強制轉換成https再送出請求. We will cover two different methods for deleting HSTS settings in Firefox. The first method should work in most cases – but we also included a manual option if needed. Close all open tabs in Firefox. Open the full History window with the keyboard shortcut Ctrl + Shift + H (Cmd + Shift + H on Mac). You must use this window or the sidebar for the below options to be available. 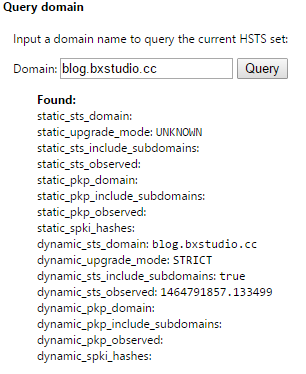 Find the site you want to delete the HSTS settings for – you can search for the site at the upper right if needed. If the above steps do not work, you can try the following method. Halfway down the page, in the Application Basics section, you will see Profile Folder. Click Open Folder. Now close Firefox so that the browser does not overwrite any settings we are about to change. In your Profile folder find and open the file SiteSecurityServiceState.txt. This file contains cached HSTS and HPKP (Key Pinning, a separate HTTPS mechanism) settings for domains you have visited. It may be very disorganized. Search for the domain you want to clear the HSTS settings for and delete it from the file. Each entry beings with the domain name. Delete the entirety of the entry from the beginning of the desired domain name to the next listed domain. As an alternative, you can rename the existing file from a .txt to a .bak (in order to save the existing file, just in case) and allow Firefox to create an entirely new file on next start up.